Berkeley, CA â€“ 3 October 2011 â€“ Before THE LI’L DEPRESSED BOY found a home at Image Comics, S. Steven Struble built the character’s story online as a popular web comic. Now Image Comics is collecting his early strips and short stories that have never seen print in THE LI’L DEPRESSED BOY, VOL. 0 TP this December. Before current series artist Sina Grace illustrated LDB’s world in his carefree and deceptively simple brushwork style, many well-known artists gave the character his first experiences with life and love. THE LI’L DEPRESSED BOY, VOL. 0 TP collects the work of Sam Keith, Jim Valentino, Jim Mahfood, and more in early THE LI’L DEPRESSED BOY short stories, all awash in appropriate shades of blue. Grace has also contributed an all-new short story, never before seen online or in print. And it’s all wrapped up in a gorgeous new cover by Lindsay Jane! 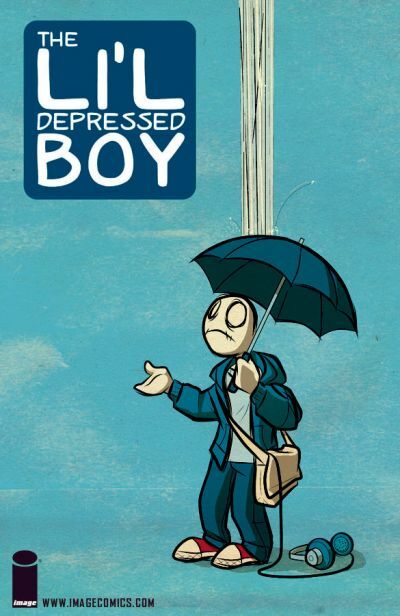 THE LI’L DEPRESSED BOY’s origin story will soon be unveiled! Before disastrous road trips. Before style-points. Before Jazmin. Join LDB as he takes his first steps on his search for love! THE LI’L DEPRESSED BOY, VOL. 0 TP (OCT110459, ISBN: 978-1-60706-476-3), a 96-page full-color indie romance trade paperback for $9.99, will be on sale in stores December 7. THE LI’L DEPRESSED BOY, VOL. 1 TP (APR110424, ISBN: 978-1-60706-390-2) is on sale in stores now. For more information about the source of THE LI’L DEPRESSED BOY, visit www.depressedboy.com. S. Steven Struble moved to Amarillo, TX to write comic books. Surprisingly, this plan actually worked out! In his spare time he also colors other people’s comics and competes on the poetry slam circuit. When not handling the duties as Editorial Director for Skybound Entertainment, Sina Grace draws comic books (THE LI’L DEPRESSED BOY), kids’ books (Among the Ghosts with Amber Benson), and big-people books (Cedric Hollows in Dial M for Magic) in coffee shops all around Los Angeles.